I have a friend. I know, I know…don’t we all? Sometimes I even have more than one at a time! Sometimes, friendships evolve as a result of “a God Thing,” which is the circumstance I found myself in by ‘friending’ a ‘friend’ of a friend on Facebook. Yeah, that old chestnut. But wait! This friend grew to be an actual friend, on account of the fact that he is a gifted writer/blogger AND loves Jesus. 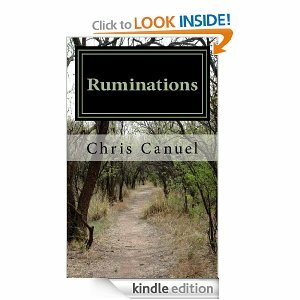 He just came out with a new book, Ruminations. I am plugging it here, because it is an excellent collection of essays on faith (and surrender) and also – because that’s what friends DO. I believe in his work wholeheartedly. Author Chris Canuel writes in his latest book, Ruminations, that if he had to sum up Christianity in two words, they would be surrender, and Jesus (no necessarily in that order.) He shares his heart transparently about each of those subjects, and his struggles to do the first in order to get to know the second. That’s so relatable. I understand that low-grade discontent so well. That’s the great thing about believers who are willing to be honest about their faith, their walk … their true ruminations. They chisel away at the boulder of Christian Perfectness in their own lives until they separate the rubble from their true likeness. After all the chiseling, the world might recognize the face of Jesus in what was formerly pretty stone-like. In the end, Canuel reminds us that we have an antidote to discontent; we just have to remember to pick it up continually. A very gracious review of my book “Ruminations.” Everything this girl writes is pure gold, thankful for these kind words.